He was born on 7 September in Sant’ Andrea in Casale, San Clemente, a village in the Romagna hinterland, 20 kilometres from Rimini. He was the sixth of nine children of a very poor family, living on his father’s occasional work as farm labourer and doing odd jobs. During his second year of primary school, when he was seven, his teacher Ms Olga Baldani talked about the mission of priests and he decided to become one. He entered the seminary at the age of 12, in Urbino first and then in Rimini. 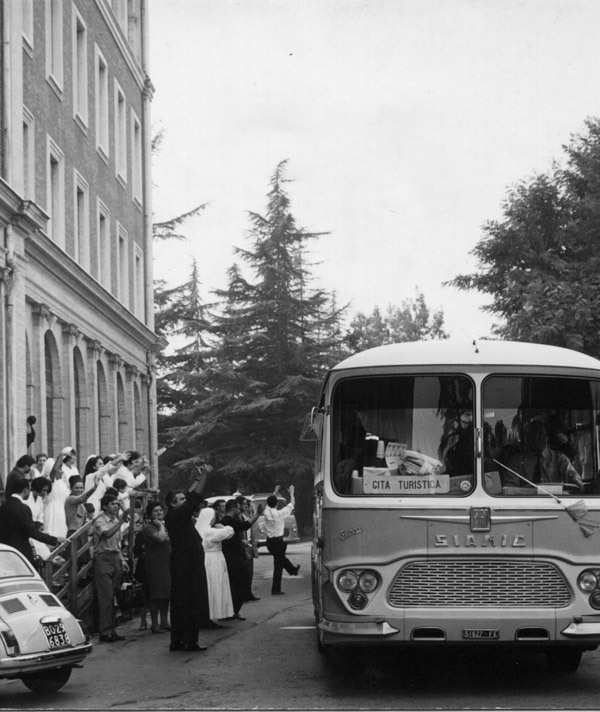 Because of the Second World War, the seminary was moved to Bologna and then to Montefiore Conca (RN), where Father Oreste completed his theological studies. He was ordained a priest on Wednesday 29 June, Feast of Saints Peter and Paul, by Mons. Luigi Santa, the then bishop of Rimini. A few days later he was appointed chaplain of the parish of San Nicolò in Rimini, where he remained for 16 months, being especially committed to the youth. He started to teach in the seminary and was appointed Deputy Assistant for “Gioventù Cattolica” (Catholic Youth) in Rimini, for which he was to become Assistant in 1952. In those years his efforts were especially focused on preteens, firmly believing that one’s life values were mostly defined at that age. He encouraged them to have a “friendly encounter with Christ”. 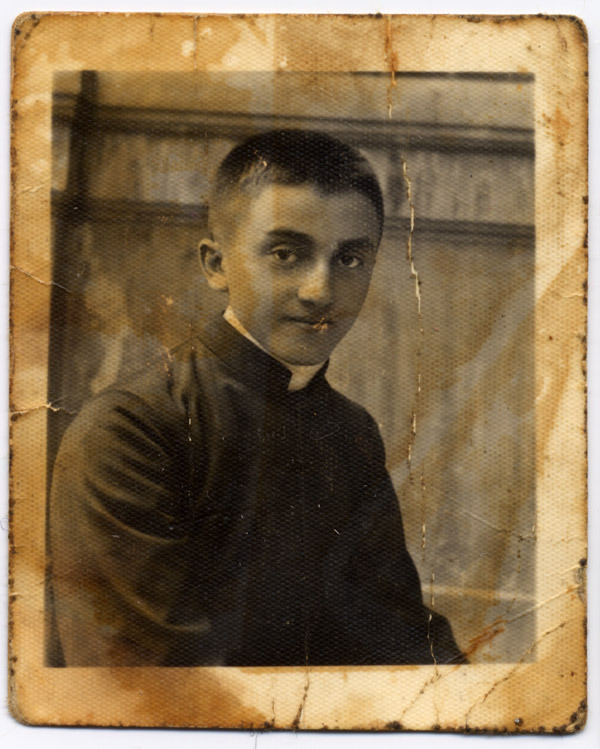 He was only 29 when he was appointed Spiritual Director of the Rimini seminary for young people aged 12–17. This office, which he continued until 1969, gave him the opportunity to better understand young people’s spirit and mind. On 12 April he set up the “Associazione per l’educazione della gioventù bisognosa” (Association for the education of young people in need) to give legal status to his activities with the youth. He organised some engaging summer camps in the mountains and realised that the enchanting Dolomites landscape could help young people open up to God’s infinity. On 14 August, authorised by his bishop Mons. Emilio Biancheri, he went to the USA with Filippo Di Grazia, a seminarian, to raise funds to build a holyday house in Alba di Canzei (TN). In November of the same year he travelled to the USA again with father Sisto Ceccarini, a priest. After two trips he returned with sufficient funds to buy the land and begin construction. Through God’s providence and a touch of folly, the “Madonna delle Vette” (Mary of the Peaks) House was inaugurated in 1961. He started to teach religion in some secondary schools in Rimini and Riccione. In those years he experimented with new ways to help young people meet God and the poor. At the same time, stimulated by the new spring of the Church, inaugurated by the Second Vatican Council, he studied in depth the Council documents with other priests. They used to meet in a place in Spadarolo, a hamlet near Rimini, which was jokingly referred to as “The University of Spadarolo”. This was a year of social and political change across the world. 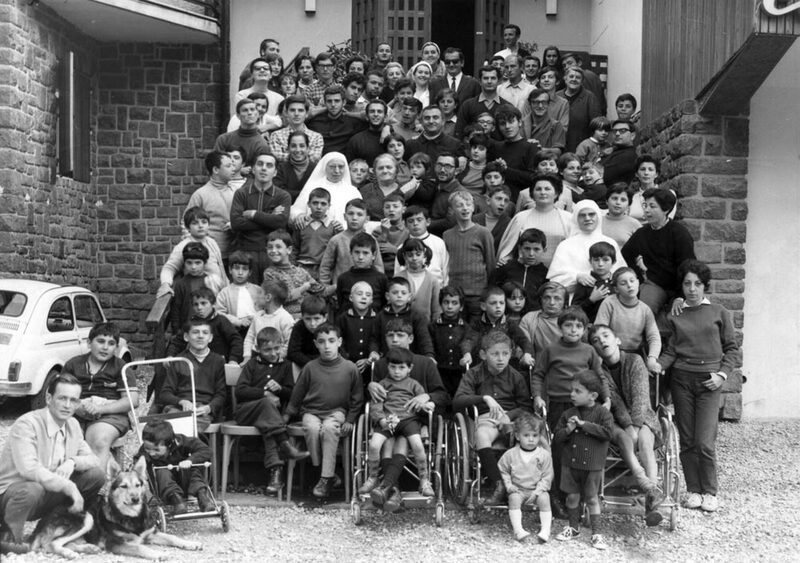 It was a turning point in Father Oreste’s life too: he met some people affected by spasticity who, at that time, were marginalised and hidden from other people because of their disability. He launched the “A camp with persons with spasticity” initiative and involved young people. In September he organised the first camp at the Madonna delle Vette house in Alba di Canazei. 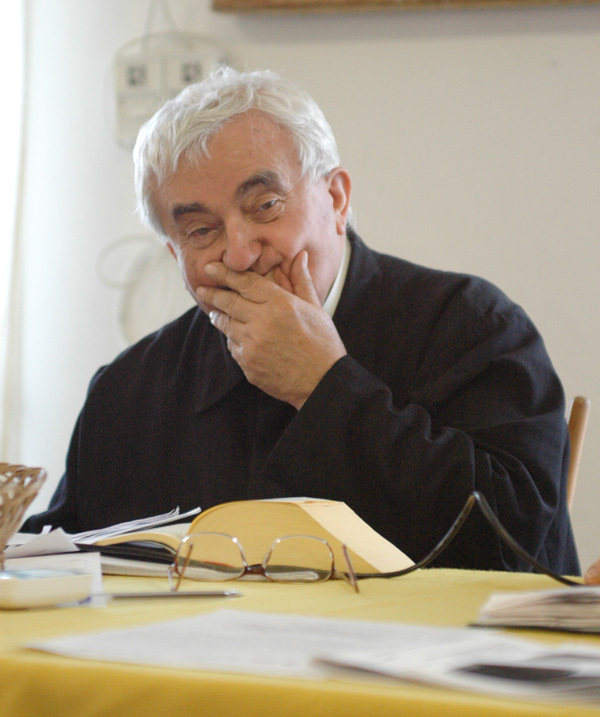 Father Elio Piccari, a religion teacher in special schools, directed the camp with the motto: “Wherever we are, they will also be”. That experience marked the beginning of the Community of Pope John XXIII. In that same year the Community held its first two-day meeting where, at the presence of Bishop Emilio Biancheri, its founding guidelines were approved. Three years later, on 13 July 1971, the “Associazione per la Formazione Religiosa degli Adolescenti Papa Giovanni XXIII” (Pope John XXIII Association for the Religious Education of Adolescents) was formally established. Father Oreste was elected President and remained in office until his death. On 1 September of the same year Father Oreste was appointed parish priest and, together with three other priests, created an innovating community of priests at the new “La Resurrezione” parish in the Grotta Rossa area, in Rimini suburbs. The following year he ended his office as spiritual director in Rimini seminary. He remained in office as parish priest for 32 years, even when he indefatigably went to the five continents to take care of the Community. He ended this office in 2000, for reasons of age, when he turned 75. 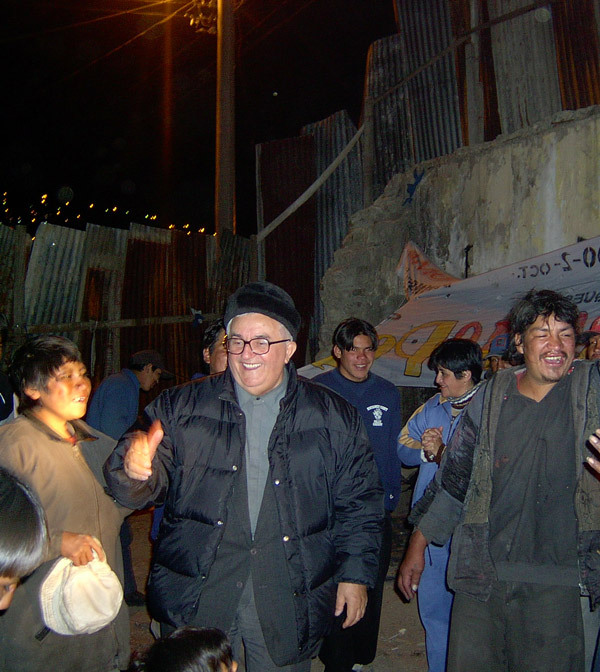 Since the early ‘70s Father Oreste’s personal history and the progress of the Community, which he had founded , were interwoven. The Community’s charism became increasingly clear: following the poor and servant Jesus who shares directly the life of the poor. It was exactly this sharing of life that, on 3 July 1973, lead to the opening of Casa Betania (Bethany Home) in Coriano (RN). This was the very first family home of the Community. Father Oreste regarded family homes as the “apple of the Community’s eye”: they gave a family to those without one. In them, the Community’s members became mothers and fathers to people in need, and tied their lives to one another just like an ordinary family. From that first family home many projects and initiatives have been developed, and they all stem from the choice of sharing one’s life with that of the poor and impoverished ones, met by Father Oreste or other Community’s members. He started the official publication of “Sempre”, the monthly journal of the Community – the journal had started to be printed in 1975 as “pro-manuscripto” – with the purpose of “being the voice of the voiceless”, ie the marginalised. Since then, it has reported injustices and shown how a new and more just world can be built through sharing life with the poor. Father Oreste was director of the journal until his death. He was a contributor for various local and national print media and, in particular, wrote weekly columns for newspapers and magazines followed with great interest by the public. This was an example of the importance to take actions to remove the causes of injustice, along with sharing one’s life with the oppressed. The dramatic situation of institutionalised children was one of the first problems taken on by Father Oreste and the Community. He organised various national campaigns to raise awareness about this issue, promote and support foster care. An annual conference of national importance was held in Rimini for over ten years, tackling various aspects of this problem. Together with other Italian associations, he contributed to drafting Italian law no.183/1984 on the right of every child to have a family. In those years the Community was also on the forefront to grant the right to work to people with disabilities. It organised a number of public demonstrations and national conferences and started the first projects of supported employment for the inclusion of people with disabilities. This led to establishing the first Community’s social cooperatives, followed by day centres which aimed at supporting families who had chosen to keep their children with disabilities within the family and thus avoid their institutionalisation. Faced with the problem of drugs among young people and answering a specific request of the then Rimini bishop, mons. 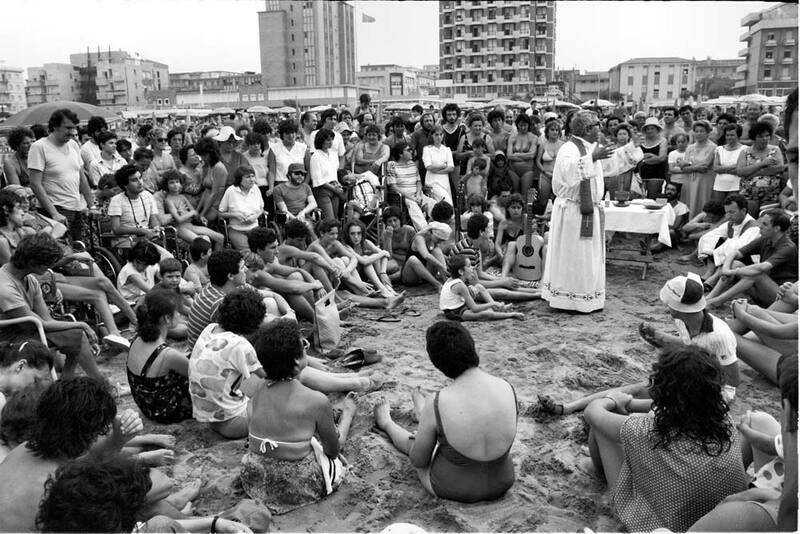 Giovanni Locatelli, he opened the first therapeutic community for substance abusers in Igea Marina (RN). Many others rapidly followed, especially in the Emilia Romagna region. He had devised a recovery path in which project workers shared their lives with recovering addicts, and he soon became one of the most authoritative voices on the matter. At a political level, he affirmed the “right not to take drugs” of every person. Following some meetings with prisoners and certain that “a man is not the same as his error”, he started to organise regular meetings and social activities inside prisons across Italy. He also opened the first emergency shelter for adults to help those who could serve an alternative sentence to prison. The centre was opened in Sant’Aquilina, Rimini, and entrusted to Father Nevio Faitanini, a member of the Community and chaplain of Rimini prison. In 1981 Dr Marilena Pesaresi from Rimini asked Father Oreste for help for the leprosy centre she ran in Mutemawa, Zimbabwe. Two young women of the Community, Tina Bartolini and Irene Tonti, took on the request and stayed in Zimbabwe for nine months. During one of his trips to Africa in connection to this, Father Oreste met Mons. Denis De Jong, Bishop of Ndola, Zambia. The bishop visited some family homes in Italy and asked the Community to open a family home in his Diocese. On 24 May 1984 the “Holy Family Home for Children” was inaugurated in Ndola. It was the first family home in mission lands. Since then, his trips abroad multiplied, from Africa to Latin America, to all five continents where he visited the existing centres and projects and started new ones. “There are many poor who will never look for us. We must go and look for them. If I don’t, I am not a true person because I say that they are my brothers and sisters”. The first “Capanna di Betlemme” (Bethlehem Hut), on the Rimini hills, stemmed from his meetings with the homeless on the streets. In this home Community members and volunteers lived together with homeless people met in the street, and offered them a path for change. Father Oreste started his commitment to free women victims of trafficking and forced into prostitution. In 1991 he started the regular presence of volunteers in the streets, to help enslaved women and viados, committing to liberate the “new slaves” and denouncing the silence of institutions. After writing for years in newspapers and magazines, he published his first book, “Con questa tonaca lisa. Fra i drammi e le violenze della società opulenta e le speranze di una Chiesa assediata” (With this worn-out cassock. In-between the tragedy and violence of opulent society and the hopes of a besieged Church). It was written in the form of a long interview edited by journalist Valerio Lessi, and in a few years it gained wide recognition. It has been reprinted and updated. Many other books followed on burning issues such as education, youth’s expectations, the tragedy of drugs, the determining meeting with God. His interventions and participation in TV programmes rapidly increased in number, and he soon became a public figure. In this year Father Oreste was confronted with the tragedy of war. The Pope John XXIII Community had been one of the first bodies to enter an agreement with the Ministry of Defence to employ conscientious objectors in civil service. Father Oreste supported the wish of some of them to put nonviolence into practice in war zones and they went to former Yugoslavia to share their life with the victims of conflict: this is how “Operazione Colomba” (Operation Dove) started. Operation Dove is the Community’s nonviolent peace corps; it aims at building bridges of dialogue between the warring parties and promoting real reconciliation. Since then, Operation Dove has been active in numerous conflict zones the world over, such as Israel/Palestine, Chiapas, Columbia, Lebanon, East Timor, Albania, Kosovo, Congo. One of his big dreams came true: on 7 October, the Pontifical Council for the Laity recognised the Community of Pope John XXIII as an international private association of the faithful, of pontifical right, and approved “ad experimentum” its Statues and Foundation Charter. In March 26 the first “prayer for life” took place outside Villa Assunta clinic in Rimini. Prayer was the nonviolent weapon chosen to combat one of the most terrible injustice committed by humans: abortion. In May 12 the “prayer for life” started outside the S.Orsola hospital in Bologna. In October 17 Father Oreste organised a “prayer for life” manifestation outside Villa Assunta. The participation of the then Rimini mayor, Alberto Ravaioli, caused controversy and political problems. Father Oreste started the first “Comunità educante con i carcerati (CEC)” (educational community with prisoners), a welcoming home where prisoners could serve their sentence in an alternative way and, most of all, pursue real rehabilitation. On 25 March the Community of Pope John XXIII received the definitive approval of its Statutes and Foundation Charter. This was one of Father Oreste’s greatest joys. On 29 November, in the Paul VI Hall in Vatican City he was received on a special audience by Pope John Paul II, with the Pope John XXIII Community. On that occasion he expressed his gratitude for the definitive recognition of the Community. On 26 September Father Oreste fulfilled another of his great dreams: to live with the homeless at Rimini’s Bethlehem Hut, defining himself “homeless among the homeless”. On Friday November 2, Commemoration of all the faithful departed, at around 2 o’clock in the morning, his big heart stopped beating. He had prophetically left his testament on the page of “Pane Quotidiano” (Daily Bread), on the comment to the first reading of that day:“When the time comes for me to close my eyes on this earth the people around me will say: he’s dead. But that is really a lie. I am dead for those who see me, who are standing there. My hands may be cold and my eyes incapable of seeing, but death does not actually exist because as soon as I close my eyes on this earth I will open up to the infinity of God”. Funerals were held on Monday 5 November in Rimini fair. Initially planned to be held in Rimini Cathedral, they were moved to give the possibility to all “his little ones” to give him their last farewell. Over 10000 people participated in his funeral mass, and it was concelebrated by 4 cardinals, 11 bishops, and about 400 priests.